The National Association for Stock Car Auto Racing (NASCAR) is a privately owned American auto racing company. 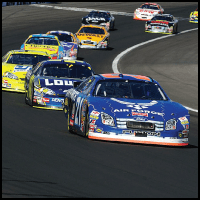 It is best known for stock car racing which is a term used for automobiles that are designed specifically for racing. Whether you wish to attend one of the larger series like the Monster Energy Cup or a smaller series, The Employee Network has the access to any and all NASCAR events!